You’ll learn the basic strokes needed to gain control of the brushes to create various letter widths as well as working with the paint consistency and flow. Learn about brush types: round, square and pointed; and which are suited to the different lettering styles such as Casual and Script. See inspiring demonstrations of her master brush skills. Barbara will assist everyone to make sure they feel comfortable holding and manipulating the various brush sizes. 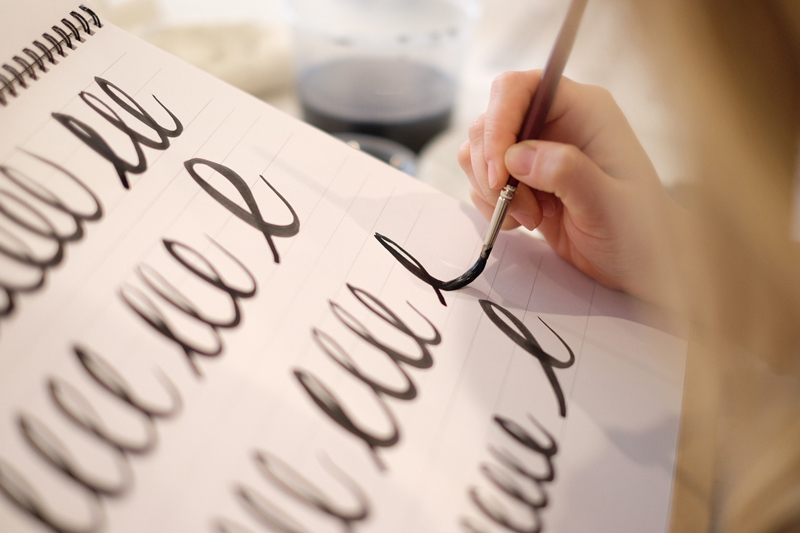 She will encourage you to develop your own individuality when lettering with a brush. Anyone and everyone who has an interest in lettering! 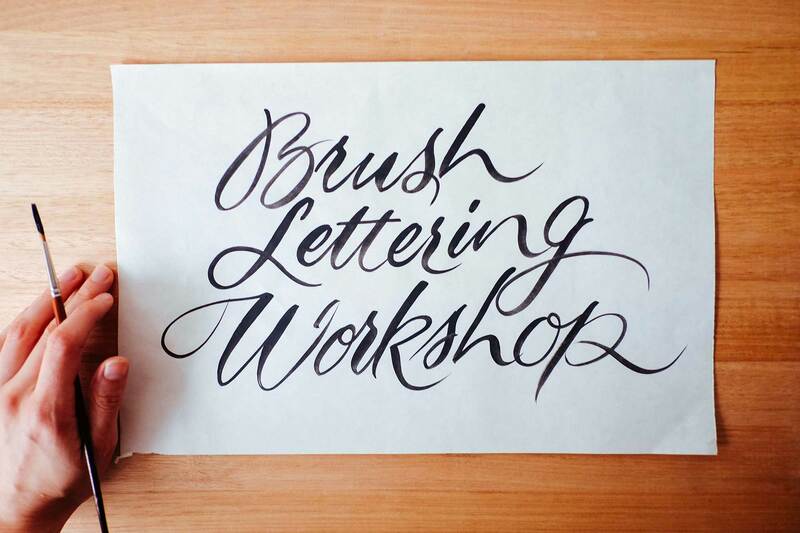 We’ll be starting with the basics so we can achieve a good understanding of brush lettering techniques. Complete beginners welcome. No experience necessary! More experienced letterers wanting to learn new styles and techniques for their commercial and personal work such as logos, signage and typographic art pieces. Your very own Brush Lettering Kit including a special lettering brush and practice guides, all in a personalised folder hand lettered by Barbara. All of your work from the weekend plus a final project demonstrating your skills. 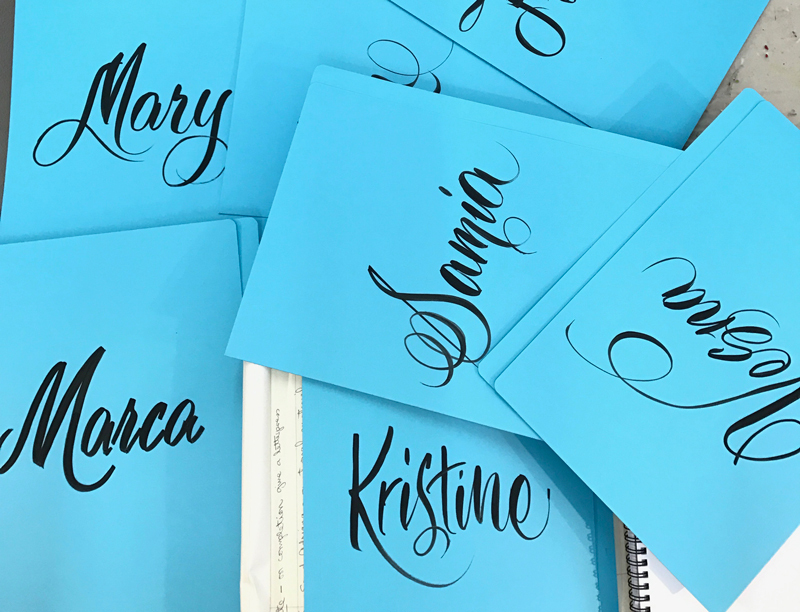 Lots of hands-on experience under one-on-one guidance from a master letterer to inspire your ongoing practice. 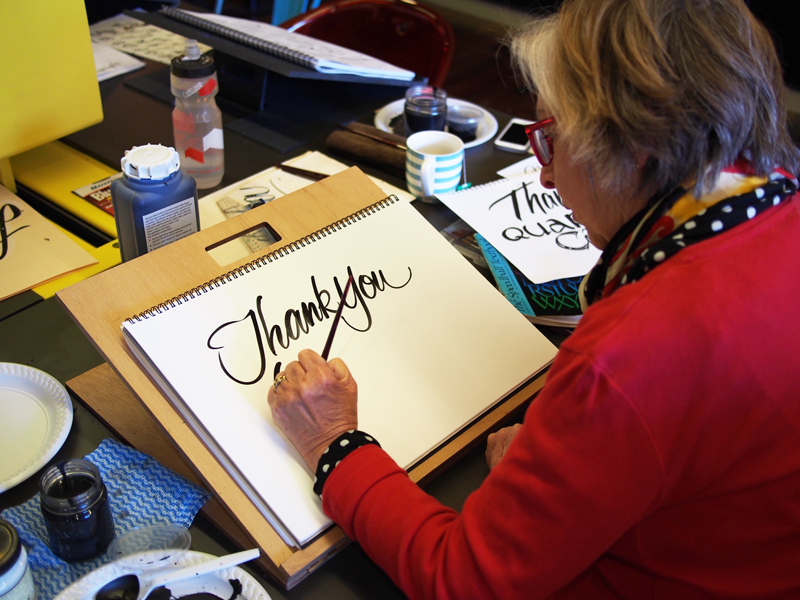 A weekend of switching off from the computer, hearing Barbara’s fascinating lettering stories and insights, making new friends, and discussion about how to make a career out of lettering. 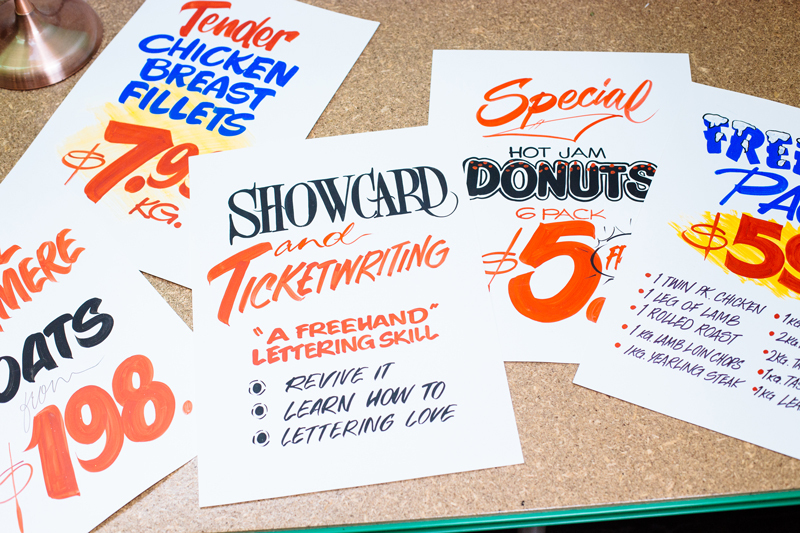 Free access (worth US$199) to learnbrushlettering.com, and the private Facebook group, so you can continue your practice at home after the workshop with 12 days of videos and 35 guidesheets. Rad new skills to show off to your friends on Instagram. Barbara and Carla met in 2013 and bonded over a love of letters and being left-handed. After Barbara had given Carla a private lesson, she realised that Barbara's special skills need to be shared with others. Since then, the pair have taught their workshops to hundreds of students from all over Australia. 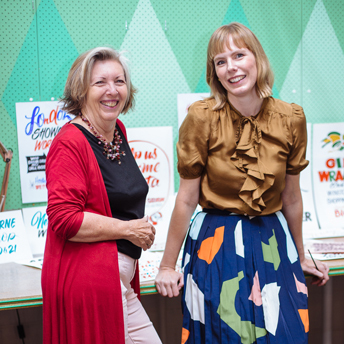 In 2016, Carla and Barbara launched their online course Learn Brush Lettering to students all over the world. Barbara studied show card and ticket writing in 1967 and hasn’t put down her brushes since. That's 47 years of lettering experience! Barbara produced thousands of ticket cards for Myer Melbourne, Grace Bros. and other retail outlets in Sydney. She started her own showcard, ticket writing and screen printing studio producing retail and promotional signage. She’s also a seasoned teacher, having taught ticket writing and calligraphy classes both privately and through TAFE NSW. Barbara’s enthusiasm for lettering is contagious! 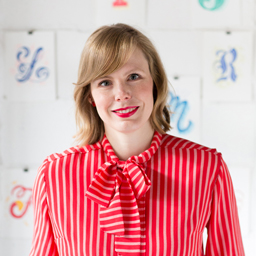 She is thrilled to hear that lettering is making a huge comeback in the design scene, and wants to pass on her years of experience to fellow lettering nerds and type aficionados. Carla is a full-time letterer and uses her brush skills for commercially for signage, branding and live lettering events. After studying graphic design at university and six years’ working at some of Australia’s top agencies in Sydney, Carla escaped to Berlin to soak up some international inspiration and nurture her love of lettering and artisan design. On returning from what she affectionately calls her “Bowie years” in Germany, Carla set up her studio with the aim of bringing a warm, unique, human element to a world dominated by digital fonts and design. 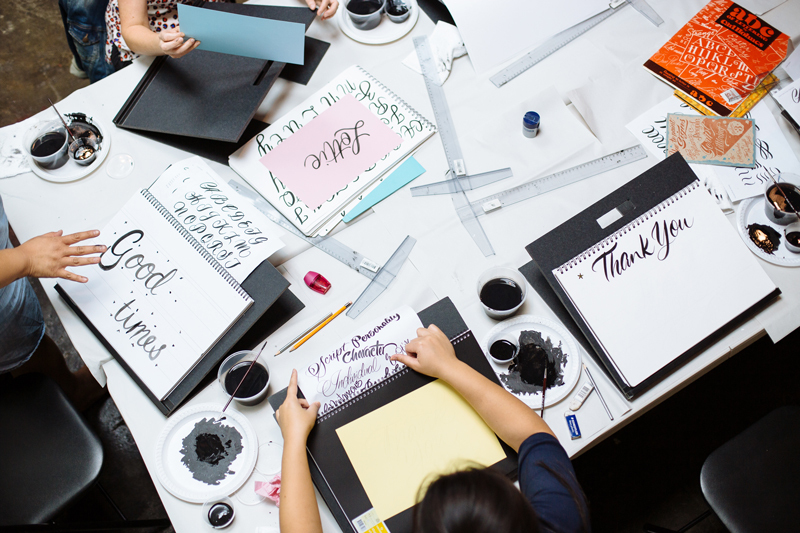 In 2016, Carla banded together with an all-girl lettering group called The Letterettes who pop up at events to create live lettering. These workshops require equipment and many hours of preparation. If you cancel up to 14 days before the course date, we can only refund you 50% of the fee to cover our costs, sorry! We’re absolutely happy to transfer it to someone else though, just let us know their contact details and we’ll switch the booking (but you’ll have to organise payment between yourselves). Email [email protected] for refunds, cancellations or to confirm the transfer details of the new attendees. We hope it doesn’t happen, but if the workshop is unfortunately cancelled, you will be fully refunded for the cost of the workshop. The workshops must have a minimum of 4 participants before they can commence. Students will be notified via email of any cancellations. 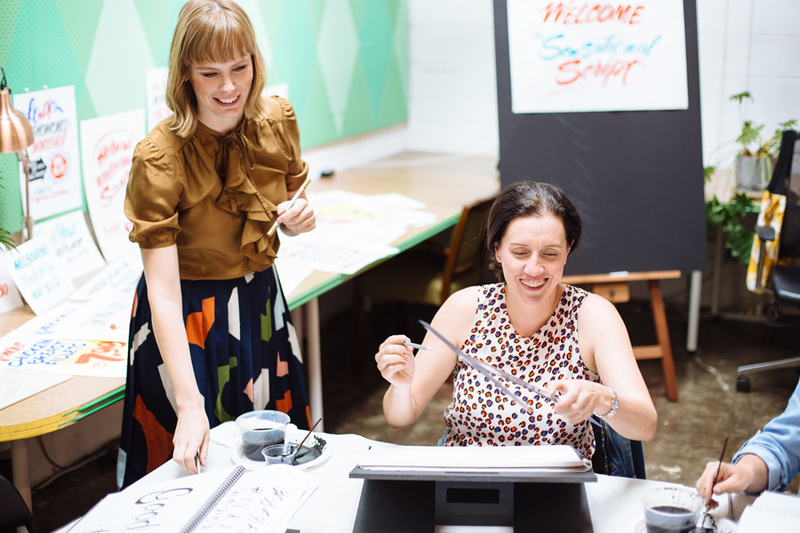 Carla is a Melbourne-based letterer who runs her studio from a sunny shared creative space Little Gold Studios in Brunswick. She hand-crafts lettering for a range of clients in creative industries, including fashion, music, food, branding, retail, hospitality, magazines, books, weddings and conferences. 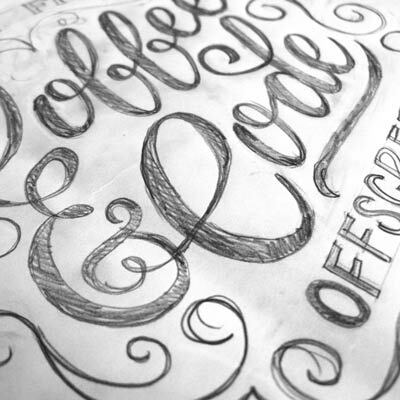 If you’re a lover of beautiful lettering, get in touch. Join my Type Lovers mailing list and receive a little bundle of typographic awesome in your inbox every now and then, showing what I've been working on and future workshop announcements.